Joining other industry/brand leaders, Van Vault has announced it is putting full weight behind a campaign to tackle tool van tool theft. Based in Loughborough independent plumber, Peter Booth (@PBPlumber), launched a petition last year aiming to get the issue of van theft taken more seriously. 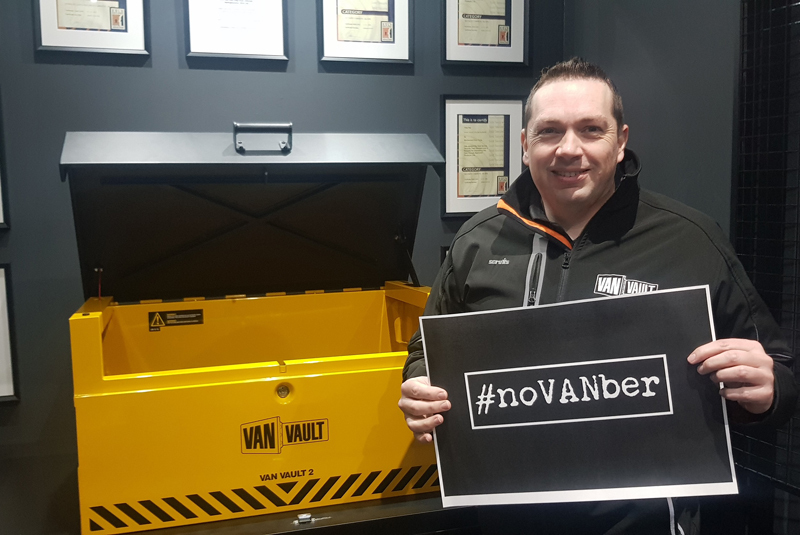 His #noVANber social media campaign calls on the Government to look at increasing ways to protect tradespeople from van tool theft. Van Vault is a UK brand of containers for storing and securing tools in vehicles. Its range is available in a variety of sizes, each designed for use is different types of vehicles. Van Vault will, therefore, be supporting the campaign by promoting the petition details across all its own social media and online channels as well as offering products to incentivise people to sign up to the petition. Recent reports claim that a van is broken into and tools stolen every 23 minutes in the UK, with an average of 62 thefts per day. This is reflected in data that shows that tool theft claims have increased by over 15% and that the value of claims themselves have risen too, now averaging around £1,692.00. Tool theft is plaguing many sectors; the construction industry specifically has recently reported that more than half of builders in the UK have had their tools stolen, according to new research by the Federation of Master Builders (FMB). Peter added: “I got tired of seeing photos and stories from tradespeople who had their vans targeted and tools stolen, stopping them from working. I didn’t think it was fair. I wanted to gather support using social media influence to try and get the Government to look at possible ways to help make this crime less profitable for the culprits.